FOOTBALL: LEAMINGTON’S patchy league form continued on Saturday as Paul Holleran’s men slipped to a two-goal loss at playoff chasing Chorley. The Brakes have now lost three out of their last five games and sit two points clear of relegation bound Nuneaton Town, who picked up a crucial win at the weekend as did 21st placed Boston United. A string of good results for teams around Leamington did Holleran’s men no favours as they remain locked in a bottom half scrap to avoid relegation as the season reaches the half way stage. Paul Holleran named an unchanged sixteen for the long trip up Lancashire to face a Magpies side with only a solitary home defeat in the National League North this season. 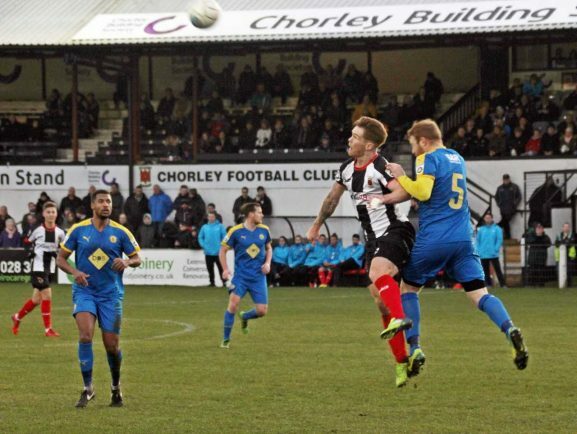 Chorley could’ve took the lead in the opening moments of the game when Joe Magunda tried to let a long ball forward travel through to Tony Breeden. But a sprinting Marcus Carver almost reached Magunda’s misjudged ‘leave’ which he hacked clear in the nick of time. Breeden was called into action soon after when Nick Haughton’s drive from a free kick was punched away. Brakes first challenged the home side’s goal when Liam Canavan won a corner, from which Kieran Dunbar delivered a cross that was too close to Matt Urwin. Canavan was again in the action when the former Kettering man sliced his first time shot wide of goal. Holleran’s side continued to live dangerous at the back though – Breeden kept his cool as the offside flag stayed down to sidestep Carver before Junior English did enough to shepherd the ball back to his skipper as the busy frontman threatened to take it past him. Added pressure from the home side meant they were in control of the game, and they were rewarded six minutes before half time when Teague powered a header home from Blakeman’s free kick. Chorley’s lead was doubled before the half time whistle blew when an unmarked Carver took full advantage of the home side’s counter attack to hit a strike into the roof of the net. Chasing a two-goal deficit, Canavan saw an early effort hit the advertising boards before Revan hit Brakes’ first on target shot straight at Magpies’ keeper Urwin. Further efforts from Dunbar and English were saved as the home side continued to hold their own. Revan came very close to pulling a goal back when he beat Blakeman in a foot race down the right before taking the ball past Urwin. He was forced wide but still managed to turn the ball towards goal at the last minute, but Teague smuggled the ball behind for a corner. Carver came close his second and Chorley’s third when he judged the bounce of the ball far better than Hood and thrashed a shot towards the bottom corner that was superbly turned round the post by Breeden. Brakes are next in action on Saturday at home to Gainsborough Trinity. Chorley: Matt Urwin, Matt Challoner, Adam Blakeman, Andy Teague ©, Scott Leather, Josh Wilson, Nick Haughton (14 Paul Jarvis, 90), Josh O’Keefe, Marcus Carver, Jason Walker (16 Adam Roscoe, 87), Matty Hughes (15 Ian Black, 71). Leamington: Tony Breeden ©, Richard Taundry, Connor Gudger, Joe Magunda (15 Ahmed Obeng, 76, Jamie Hood, Junior English, Kieran Dunbar (16 Rob Thompson-Brown, 85), Joe Clarke, Kurtis Revan, Liam Canavan (12 Callum Gittings, 70), Kaine Felix.